It's Friday the 13th. Shouldn't you be running and hiding somewhere? Dude, we better let that foolishness go! Let it go! Go! Go! You'd think modern man would have eliminated this silly notion of good and bad luck but no ... It's still all around us. We see this strange behavior especially during this season of Halloween. People just love to scare and be scared. Real estate is one industry that is highly superstitious, I mean, when was the last time you got off the 13th floor elevator? Probably never, huh? When was the last time you saw a house numbered 13? In Japan, one of the most modern countries in the world, you will find all sorts of strange homage to trees, rocks and carvings. And they celebrate rituals and parades to ward off evil spirits. And the kids love it. And the parents encourage it. And the cycle continues. I don't think they really really believe that stuff. To them it's a game (at least it looks like it). it's more of a tradition than anything. So why do they do it? Could it be that they're "stacking the deck" --- covering all the bases? In some gatherings there are people who rub handkerchiefs on inanimate objects in the hopes that by some inexplicable metaphysical and molecular level the stars will align and good luck will come down from heaven and bless them. They may not believe it entirely but they justify that there's no harm in doing this --- "who knows? It just might work," they say, "we might just get lucky." Should we believe in luck or should we believe in blessings? It's a confusing world. And I am not one to tell you what to believe. I just want us to look at the mirror and observe the silliness of some of our traditions. It may be fun but how is that affecting our kids? Friday the 13th? It's just a day and a number. Nothing else. It's just another day blessed by the Lord. Hey, don't think I am asking you to drink. This is just a fun video. More amusing than funny. Super cool. Look at the lengths drug traffickers go through to transport their wares. This magic trick was developed after the terrorist attack in Paris. You could easily step off the elevator onto the 13th floor in HK, and China or essentially Chinese territories BUT, these places don’t have 4th, 14th, 24th, 34th floors etc. The number 4 is the bad luck for them, I think the work sounds much like the Chinese word for death, and when it comes to superstitions, I think the Chinese top it with their New Year's forecasts (year of the whatever animal) and Feng Sui. Awesome article and that beer commercial was awesome too. You are absolutely right with the lawyers. Thanks for making our TGIF more pleasant. 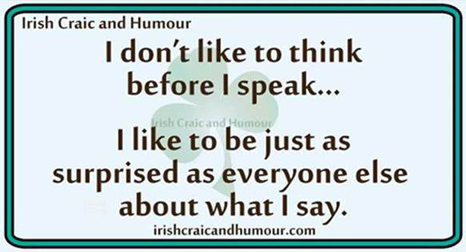 Thanks Raoul I really smiled at the one about not thinking before I speak. Today is the one hundredth anniversary of Our Lady of Fatima in Portugal and the 242nd Anniversary of the U.S. Navy. This day of 13 did not dissuade them from Celebrating. Superstition is not in my belief either. Thanks for what you do with this every Friday. Loved the joke. Amazing drawings. Passed it on.